Outbrain helps brands promote content and they use their business blog to help and attract potential clients. 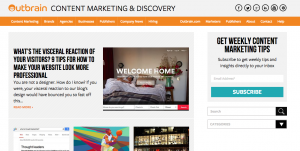 Outbrain helps content producers get their content discovered. Creating content for an audience is not easy if you want to do it well, but even if you create great content it’s difficult to get it discovered. It takes time for organic traffic to build and it also takes time to build a social presence that will attract traffic. Outbrain offers another way to get content. On a basic level, you advertise your content in front of your ideal readers. You’ve probably seen “Promoted Stories” on sites like CNN. Those are usually Outbrain helping out clients. Outbrain works with the biggest publishers like CNN to offer advertising space for content pieces to others. It’s a great way to supplement the traffic you attract with your content. And what I love about Outbrain on the blogging side is that they’re creating their own content on their own blog to attract and help content producers. Studies are a great tool for just about any business blog. There are organizations that perform studies for most industries. You can find official studies from education organizations or government organizations. And in the private sector, many firms perform studies and share it. So as a business you can take a study that is news to your audience and then take it a crucial step further by offering the next step advice your audience can act upon. I really found this post to be interesting: The 39 Most Interesting Fashion Brands Today. Outbrain did their own research and data analysis on this one. They looked at how consumers were looking at fashion brands and came up with a list of the most interesting brands during a time period in early 2015. It’s a great idea for research. The list itself is sharable and interesting, but even better is the analysis and insight Outbrain provides after the list. They talk about how companies can measure the impact they’re having and why being interesting can be a good thing and why a brand may be interesting at any moment in time. It’s also good to look at brands like this especially in a positive light. You can bring your own brand and service to their attention and if any of the fashion brands create content they now know about Outbrain (if they didn’t already) and they may become intrigued and contact Outbrain for content promotion services. I don’t know if I’ve commented on this before in Blog Analysis posts, but it’s important. In that post above about the fashion brands there is a photo at the top and at the bottom of the post is an attribution link to where the photo came from on Flickr. We do this with many of our clients at Ghost Blog Writers. Photos can add to the engagement of a post and can help communicate and connect with the readers. Some users on Flickr upload their photos using Creative Commons. There are a few different levels of Creative Commons, but basically the owner of the photo allows you to use it as long as you provide that attribution on the post. It’s a great way to get great photography for your posts. If you do use Flickr I like to start with the Flickr Creative Common Search page. And make sure you see Some Rights Reserved on the photos you use. “Copyrighted” means you cannot use the photo. It’s easy to get caught up in providing tips and insight to your audience. But there is another side to content marketing and that is showing your personal side. Outbrain does that in a way with this post on random acts of kindness. They gave clicks to some of their favorite organizations, but what this post does is show the culture at Outbrain. They care about giving back. They could have done it without a post and that would have been fine, but by sharing what they’re doing they encourage others to do the same. And it shows readers the kind of values Outbrain has and that can lead to positive relationships; both partners and client relationships. Outbrain publishes pretty often. I counted 13 posts in February so that’s about one post every other day. Some posts are published on consecutive days. Some are published on the same day and sometimes a few days can pass. It’s great that Outbrain is publish so often especially with great content. But some businesses struggle with this approach. We’ve found that coming up with a consistent schedule is best. You can get into a routine and you kind of force yourself to publish on specific days. So with Ghost Blog Writers, we publish every Monday, Wednesday and Friday. I have days when I write each post and schedule them. I brainstorm ideas ahead of time. If you do it more on a loose schedule it can be easier to skip doing a post now because you can’t think of anything and that’s a slippery slope. You miss one, then two and in a few months you realize you don’t have any posts. Outbrain obviously is keeping up very well with their posting, but sticking to a regular schedule often works well and you force yourself to post and your readers can get into a routine of reading every Monday or whatever day you publish. Outbrain does a lot of great things with their blog. I had a hunch that they would have a wonderful blog with great information. They have a lot of different categories for different types of posts all that are interesting to the target audience. There are tips and research and industry insight and insight into Outbrain. It’s all great and it’s a good example of the approach just about any company can take with business blogging and content marketing.